"Here is the repulsant snozzcumber!’ cried the BFG, waving it about. "I squoggle it! I mispise it! I dispunge it! But because I is refusing to gobble up human beans like the other giants, I must spend my life guzzling up icky-poo snozzcumbers instead!" 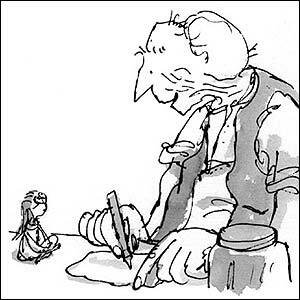 Tonight I decided, for reasons I cannot grasp, to find a list of all the fizzwhizzling made-up words in the BFG, my top-5 (really) Roald Dahl book of all time. I searched around on the Internet for a while, and finally found this post. Put up yesterday. The world is just a flushbuckling place.